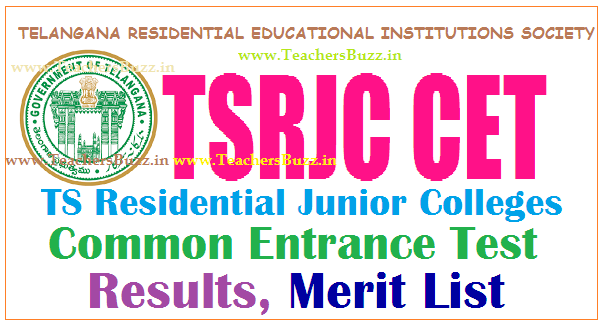 tsrjdc.cgg.gov.in TSRJC 2018 Results Counselling Merit List TSRJC CET 2018 Results, Key, Question Papers Results 2018 eenadu, sakshi: TSRJC CET 2018 Results, Counselling -Merit List MPC,BPC,MEC/CEC | tsrjdc.cgg.gov.in TSRJC CET 2018 Intermediate admissions entrance Exam was conducted on 12th May 2018 at different centers across the Telangana State and after finishing of this exam, Candidates, start searching for tsrjc2018result, tsrjc 2018 cut off marks and also for previous tsrjc 2018 cut off marks. Our web Portal provides to you link of tsrjc results 2018, more information about for download result counselling dates,certificate verification so candidates are keep in your mind and please visit regularly on our portal. TSRJC 2018 results, TSRJC 2018 Key, Question Papers will be announced soon by Telangana Residential Educational Institutions Society (TREIS) on behalf of Telangana State Council of Higher Education (TSCHE), Hyderabad. The entrance test held on 12th May 2018. The candidates who have appeared for TSRJC CET 2018 can check their result from official website http://tsrjdc.cgg.gov.in. Telangana State Residential Educational Institutions Society(TSREIS) officials issued the TSRJC Common Entrance Test 2018 Notification in March 2018. This RJC Entrance Exam for admissions into regular Intermediate first year courses in its Telangana State Residential Junior Colleges in TS State for the academic year 2018-19. TSREIS would invite online applications from 06-03-2018 to 15-04-2018 through its official web portal from the eligible students, who were SSC passed students for admission into inter first year groups in its TSRS Junior Colleges. The TSRJC 2018 test successfully held on May 12th, 2018 at all district head quarters across the Telangana state and it was conducted with peacefully. This entrance exam was conducted in five streams viz MPC, BiPC, CEC,CGDT and all for 150 marks and test pattern is objective type and each question carries one mark.Subject Experts has prepared Key of this entrance exam. The Key and Question Paper provide here. So, Download the Question Paper with Key and Check your marks. TSRJC Entrance Test 2018 appeared students are waiting for their results. The TSRJC CET 2018 results will be released on 19-05-2018 (tentative date). Candidates can check their results at the official web portal soon.